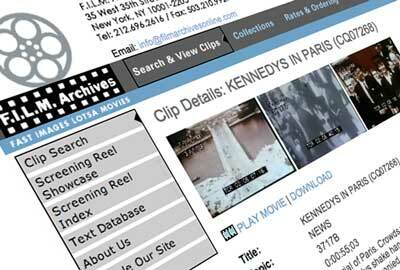 Home » FILM Archives: CatDV powers this Stock Footage search and ordering firm. New York City-based stock footage library FILM Archives Inc. turned to Square Box Systems Ltd. to create a custom-built online catalog solution for its large inventory of vintage and contemporary film and video. Collections include a century’s worth of movies, TV shows, commercials, newsreels, and documentaries. Square Box’s Live HTML Publisher option runs on top of our CatDV Enterprise Server to provide clients with lightning quick web browser access to thousands of clips in our library,” said Mark Trost, FILM Archives president and CEO. Rolf Howarth and his team built the stock footage catalog essentially from scratch in CatDV, then added the web component and smoothly integrated Live HTML’s generic web pages to match the look and feel of the company’s existing web site. “One of the nicer touches was Rolf’s idea for an email clip basket our clients can use to collect links to QuickTime clips of interest,” Trost said.